The highly anticipated second volume of Karl Ove Knausgård's six-volume memoir delivers the same immersive reading experience as A Death in the Family. Exploring the struggles of falling in and out of love, A Man in Love is a weighty and personal book. 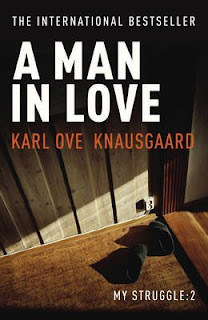 Joining Karl Ove as he leaves his first wife amidst a bout of depression, the book follows his journey back to happiness; the passion and complication of his relationship with Linda, the sheer joy of becoming a parent for the first time, and coming to terms with the world as it is. While the first volume focused on Karl Ove as an adolescent, A Man in Love is about his life as an adult. It reads as a book about self-discovery, about finding one's way in the world, and there is a particular focus on how he feels about his own writing, and what he believes it should achieve. Knausgård's writing is incredibly frank and open, which is what makes him so successful and controversial. As a reader, one is aware that he writing about people who are still alive, people he loves and cares about. No matter what your thoughts on the ethics of his writing though, there is no denying that he has a talent for contemplative, detailed prose, which reveals the world in a new light.